In order to imitate the sun, we use a method that is not new, but has simply not been so present up to now: We use Directional Light; the incident light beams are parallel and therefore this is a close representation of natural sunlight. The use of directional light as sunlight in pCon.planner 8.0: The “sun” can be moved directly in the planning area, it can also be adjusted in color. Consequently, the lighting situation can be assessed realistically immediately. Like any other light source, you can insert a Directional Light into your planning via the Room Elements group and can intuitively move and adjust it at any time in your planning area. The changes are visible directly in the planning – which saves time you would have invested to create sample renderings to assess the lighting . Another advantage of using directional light as the sun: it shows its effect in renderings, no matter which renderer you use – OSPRay, Yafaray and of course in the real-time display. 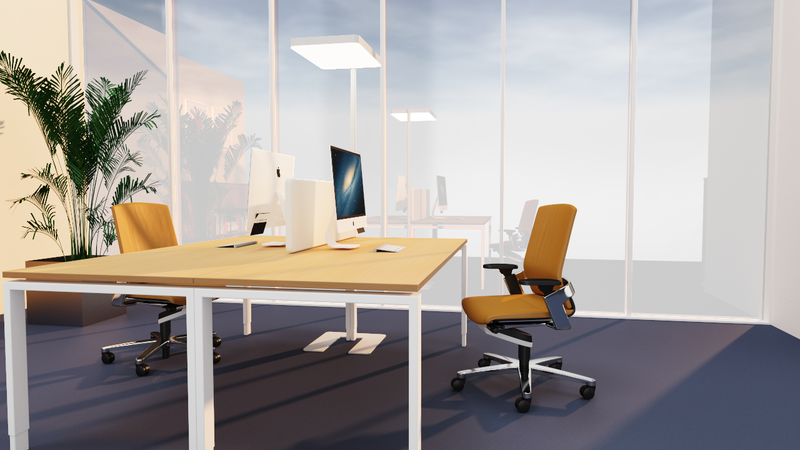 The rendering was created in Filmic mode: The lighting of the scene is the same as in the planning area. More information about lighting in pCon.planner can be found in the pCon.planner Help Center. Addition (12-04-18): To get a realistic preview of the shadow cast in the real-time view, the real-time shadows have to be turned on. You can control the shadows in the settings of the light sources – individually for each single light source. To ensure a fluent planning experience, we recommend deactivating the shadows after the image creation. This entry was posted in Presenting and tagged OSPRay, pCon.planner, pCon.planner 8, rendering. Bookmark the permalink.